Gérald Genta is a man to who many brands owe a great debt. As a designer, he gave Audemars Piguet the Royal Oak, Patek Philippe their Nautilus, and he worked on the Pasha for Cartier, as well as many iconic designs for other brands. What not everybody knows is that he was next to a designer also a watch manufacturer and, in fact, a pioneering one. It was already in 1969 that he founded his manufacture and as could be expected it turned out innovative watches. With the ‘Gefica’ did Genta introduced a bronze case before it was cool, but that was not all. Another signature complication, or actually two, would, later on, dominate Genta’s collection; the jump hour and retrograde function, the latter which he used initially to indicate the minutes but later on also for the date. In 2000 Bvlgari acquired the manufacture, and Gérald Genta continued to exist as a separate brand until 2010. Profitability was an issue and by integrating the team into the Bvlgari organization, the knowledge of decades was saved as well as about 80 jobs. In fact, it was that knowledge that became one of the pillars of the future watchmaking capability of Bvlgari, contributing to creating their ultra-slim tourbillon, but also to the Grand Sonnerie, as this type of watch also used to be a speciality of Gérald Genta’s manufacture. Fast forward to 2019, as Bvlgari has decided to pay tribute to the man, his manufacture and his (indirect) contribution to the watchmaking powerhouse that Bvlgari now is. They do this by introducing a new version of the Gérald Genta Arena Bi-Retro. It features a 41mm large platinum case in typical Gérald Genta style, with a polished domed bezel and caseband which is decorated like the outside of a Roman arena. A beautiful deep blue dial features a jumping hour, as well as a retrograde indication for both the hours and the date. Bvlgari retained all the typical hallmarks that Genta put into its watches, and even a signature of the mother company cannot be found on the watch. Of course, we recognize the movement as one from Bvlgari’s stable, with the typical full bridge over the balance wheel, which we, for example, can also find in the manufacture caliber BVL 191, which powers many watches from the Octo collection. 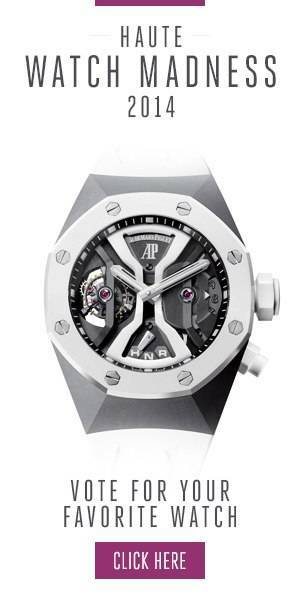 It offers a 42-hour power reserve and runs at 28.800 vibrations per hour. The fact that this watch is only signed with Gérald Genta’s name and not Bvlgari might hold the promise that the brand will return under its own banner. Bvlgari is tightlipped about this one, saying with a smile that they first want to see how this new Arena Bi-Retro, which is available through Bvlgari’s boutiques, is received.